When truffles come to mind, most people think of chocolate. As much as I like chocolate, it can be a pain and messy to work with. An easier alternative (at least to me) is making truffles using cake or even cheesecake. I like the idea of making a cake that doesn't have to be perfect, smashing it up to pieces and then rolling them into balls and coating them. 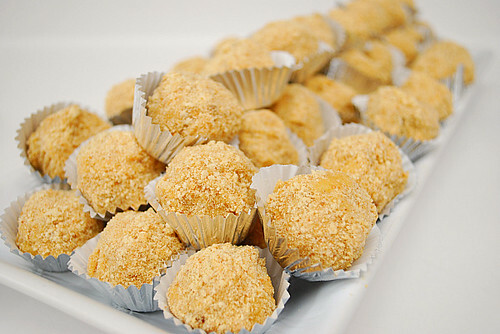 That's exactly how I made these Passion Fruit Cheesecake Truffles. I started with my go-to cheesecake recipe which I baked up. After baking, the cheesecake cools and then is smashed up in a large bowl. I added a reduction made of passion fruit pulp and some sugar to the bowl along with crushed graham crumbs for the right truffle consistency. The mixture is then left to chill and set up a bit before scooping and then rolling in a coat of more graham cracker crumbs. The end result is a pretty easy cheesecake truffle! Now if you're looking for convenience, skip making the cheesecake from scratch and use a frozen pre-made cheesecake. (Don't worry... I won't tell!) If you're not able to find passion fruit pulp, no worries. Use whatever cheesecake flavor you do like and make them into truffles... the possibilities are only as limited to whatever cheesecakes you make or purchase! Combine thawed passion fruit pulp and sugar in a small sauce pan. Allow it to come to a boil and let it reduce down to 3-4 tablespoons, about 10-15 minutes. * You can find passion fruit pulp at Latino markets in the frozen section. Place the chilled cheesecake and the passion fruit reduction in a large bowl and mash up until fully combined. Using a small scoop, scoop mixture from the bowl and roll into a small ball with your hands. Roll each truffle in the remaining graham cracker crumbs to coat. Serve chilled or at room temperature. These truffles look yummy!! I already bookmarked this recipe. I think I want to give you a hug! These look phenomenal!